ATLANTA, Georgia (CNN) -- There I was, trying to wedge a microphone under my arm while simultaneously pressing colored buttons on a plastic guitar with my left hand, strumming it with my right hand and crooning, "I want to hold your hand ..."
CNN's reviewer doesn't recommend trying to play "The Beatles: Rock Band" alone. So while it's theoretically possible, "The Beatles: Rock Band" -- whose 9/9/09 release coincides with the debut of remastered versions of the Beatles catalog -- should not be played alone. Besides the impracticality of multiple-instrument play without the right equipment, there is something rather lonely about attempting to play in a world-famous band by yourself. When there are a lot of people in the room, however, the game -- which allows players to emulate the guitar, drums and vocals of the famous British foursome -- does make for a great time and will probably be a hit at parties. Depending on how many controllers you've got, six people can join in the musical fun at once. Even when you're not playing, there's a lot going on. You can watch animated re-creations of the Beatles rocking out on the TV screen, and enjoy the colorful graphics, while your friends try to hit the notes. There's a somewhat accurate animated version of John Lennon looking right at you! The songs span some of the greatest hits of the Fab Four, from "A Hard Day's Night" to "Twist and Shout" to what the game deems most difficult to play: "Helter Skelter." Watching the screen, I couldn't help think of the movie "Across the Universe" -- but that's because I was born decades after the Beatles broke up. On "quickplay" mode, you can choose from dozens of songs on demand, but to get the full experience, you have to go into the "story." That means starting at Liverpool's Cavern Club in 1963 and progressing in time as the band got more famous. I tried out only the first two venues, but apparently you get to continue playing with the boys right on through their fabled 1965 Shea Stadium concert and 1969 rooftop performance at Apple Music headquarters in London. The further you get in the game, the more songs and other goodies you unlock. I collected a few photographs in my gameplay but not enough to get a "prize" or hear the much-publicized greeting from John Lennon on a rare 1963 Beatles Christmas record. While you're gearing up for your next performance, you can see footage or animation of the Beatles in various settings. And if the 45 songs that come with the game aren't enough, you can go online and download more for $1.99 each. I found the difficulty levels on "The Beatles: Rock Band" to be easier than in the traditional "Rock Band" games. On many of the songs, "easy" is quite rudimentary; in fact, while attempting to both sing and play guitar without a microphone stand, I cleared one song with a mere 26 percent accuracy on vocals. "Medium" on guitar and drums with the Beatles also seems easier than "medium" on "Rock Band," while "hard" was sometimes just challenging enough for people who had played many times before, with "expert" mode still perhaps beyond reach. 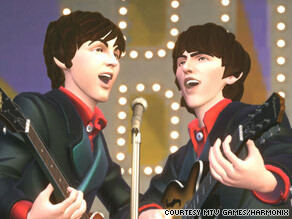 The audio of the Beatles singing is also more prominent than the vocalists on the regular Rock Band tracks. In other words, it's quite clear that you're singing with the Beatles and not replacing them. With more than one microphone, multiple singers can try out "harmonies," a feature that distinguishes "The Beatles: Rock Band" from its predecessors. When you've got only one microphone, as I did, this means stumbling around with your voice, challenging yourself to hit something that kind of sounds good with the track that's playing but that isn't the melody. The game doesn't penalize you for not singing harmonies, but finding the right blend is an interesting challenge that will surely appeal to more sophisticated vocalists. When multiple players fail out and you have to start again, there's no booing; after all, who would boo the Beatles? Wondering about the larger importance of the game for music history and proficiency, I consulted two experts. Steve Everett, professor of music at Emory University, said the concept of "The Beatles: Rock Band" engages kids to learn about an important 20th-century cultural phenomenon. The band members were icons of a 1960s generational shift that called for new social structures, questioned institutions and carried a "certain optimism," he said. Will games like "Rock Band" discourage people from taking up real instruments? Dan Trueman, professor of music at Princeton University and a director of the Princeton Laptop Orchestra, isn't worried. The people who really want to become musicians will do so, he said in an e-mail. "I think this looks like a great way to have an intense, physical listening experience with music," Trueman said. "The more exposure to music, and in as many ways and contexts as possible, the better," he said. The game, which I played on an XBox 360, is also available for Sony's PlayStation 3 and Nintendo's Wii. For a hefty $249.99, you can even buy a limited-edition Beatles guitar and drum set.